The environmental, economic, and societal impacts of the surface mining practice in West Virginia termed mountaintop removal mining (MTRM) have attracted considerable attention recently. MTRM mining operations are large areal surface mines that involve the systematic removal of rock layers to uncover coal beds so that they can be mined starting from the top of mountain ridges and proceeding down to a level where the economics are no longer favorable. 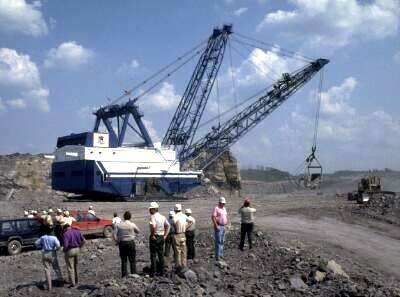 The practice utilizes large earth moving equipment such as the dragline and dozer, as shown in the picture below. Rock layers broken up during the mining process take up more volume than the original undisturbed layers; this excess material is placed in the steep heads of streams along the mountainside in areas called valley fills. As mining is completed, the remainder of the material is used to return the ridge tops to the approximate original contour. West Virginia Geological and Economic Survey coal geologists were asked to appear before the Economic Committee of the Governor's Task Force on Mountaintop Removal and Related Mining Methods on October 26, 1998. The report summarizing the information presented to the Committee can be accessed below. Related material on mountaintop mining activity, Remote Sensing Analysis of Mountaintop Mining Activity Using Landcover Classification and Change Detection Techniques, is available at the West Virginia Division of Environmental Protection Web site. Download Adobe® Acrobat® Reader® here: http://www.adobe.com.